On a monthly basis, Multimedia Makeup Academy gives its prospective students an opportunity to learn more about the academy and how it has prepared its students for a lucrative and fulfilling career. This past month, Brandi Myree (our Admissions Director) sat down with Megan Walker to discuss her experiences with Multimedia Makeup Academy and how her career is going. Brandi: [00:00:00] Megan, thank you so much for being here. I appreciate your time. Thank you. I'd love for you to just kind of introduce yourself to introduce your brand who you are what you do. So who is Megan Walker? Megan Walker: [00:00:42] All right excellent. My name is Megan Walker. I am now a licensed institution and makeup artist working in downtown Utica, MI. I work for a salon: Caidy Marie Beauty. And it's just been a whirlwind ever since I left MMA. And it's been a really great transition into aesthetics makeup. And like you said, I have dabbled in so many different areas that it's really, honestly, been very diverse, which I appreciate. So I have a lot of questions because these are questions that I believe the audience would want to know if they were looking at MMA. What was your experience in the classroom like? What would a normal day look like in the life of a student at the moment. Megan Walker: [00:01:31] OK. So you know you kind of roll in your cases and kind of get set up, get started at the beginning of every class. We would have a theory portion that we would really learn the basics and learn the fundamentals. Like you said, I did core media, the intro to special effects, into the bridal program. So in each program, we would be learning the fundamentals learning color theory, and playing with texture and learning about different products. We would absorb all of the basics, and then we'd go out, and we would watch an instructor do a demo which was super helpful kind of watching everything kind of unfold and then we would go out and practice and do hands-on training on each other, working on models and then we would have a little bit of a final. And then we'd be starting the next segment into our program. So great is a great transition. Brandi: [00:02:28] Yeah it kind of makes sense just to go over the structure of the class, as you said. You're learning a little bit of the theory and going over the concept that you would be learning or the instructor is going to demonstrate, and then you're going to do hands-on. How much of your class time would you say was spent doing hands-on training? Megan Walker: [00:02:46] Maybe more towards 80 percent, but I would say we definitely I had a lot of time to practice and train. So a good portion of the classroom was dedicated to the hands on. I think anybody going into the makeup world industry is very visual. So I guess I know for me personally I'm a very visual, hands-on learner. It's kind of silly. Like even recipes. I like to watch a video of it being prepped and cooked. So to have the demo, the theory portion, and then to go out and just practice. It was instrumental to our training and learning. Brandi: [00:03:39] Yeah very important I think that's a beautiful point. A lot of people that enter the makeup industry do it because they are visual and they want something where they can use their hands and so it would be essential to learn that way too. So another question that I have for you is can you tell me how you felt once you were done with your program? How "ready" did you think you were for your career? Megan Walker: [00:04:04] I felt so prepared. You know obviously going into a new career. You're a little nervous you're a bit hesitant. You don't know which path to take. But. I felt very very prepared. 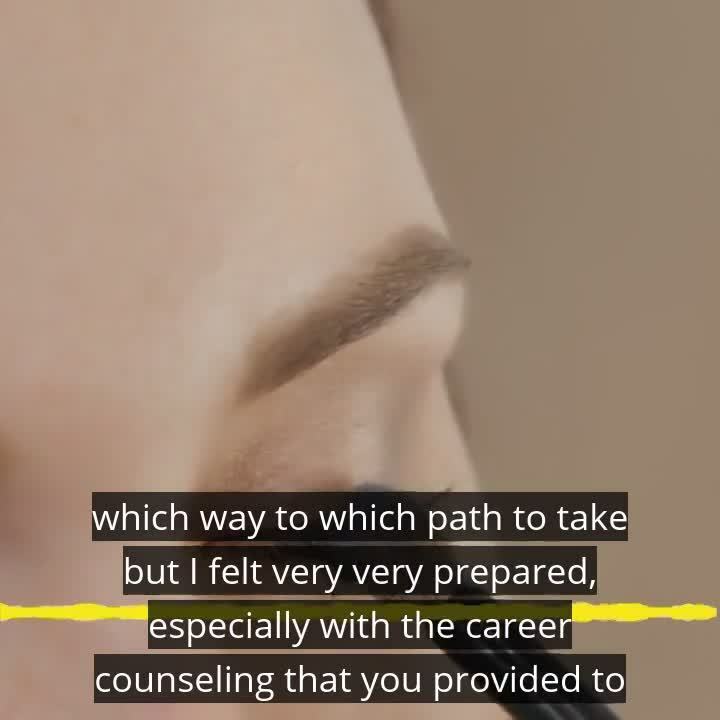 Especially with the career counseling that you provided to me. I actually got a job before I even graduated. A couple months before I graduated. So thanks to the career counseling and thanks to the preparation and thanks to the business courses I was successful. I know for me too specifically I was definitely more hesitant and didn't know which path to take. But once I kind of put myself out there made that first step I felt fully prepared. Brandi: [00:04:43] That's awesome. I think that's a huge deal. I mean getting a job before you even finish your program is pretty amazing. But I think that something I would definitely want to know if I go through this education: Am I going to have a place to work? Business coaching and counseling classes are a big part of the programs. So tell me a little bit about what your experience has been like, and you can talk about maybe experiences that you had while you were at the academy, and afterward,how have you used the skills that you've learned. Megan Walker: [00:05:28] Well as you've mentioned before I dabble in film, television, commercial, and I highly specialize in bridal. So I really do love the variety the diversity. Every day is different. I enjoyed being on set and working with a team and collaborating and I think the biggest thing that I took away from MMA was the community. I think that you know those core principles were really drilled into us and very rightly so. And that is the biggest takeaway and the thing that I've used the most to me to stay and lucrative and to stay working and to stay current and. Especially the sanitation. Number one I think that sets the school apart and working and working in the industry. So there are so many things to take away from the academy that you know if I would have started a career without this I wouldn't be where I am today. So as far as the experiences you know outside I've worked in I worked on a NASCAR shoot. I've worked on two feature films. You know our team specializes in bridal, so we've done as a team 80 weddings a year 80 to 100 weddings a year. So I love the variety out of my experiences have been so different. I think I just jump into things. No, not necessarily. So I've taken away so much from the academy as far as the community. The instructors I still talk to so many of our colleagues and people that I've met not only in classes but just from all of the networking events that you guys provide as well all of the makeup meetups all of the sanitation conversation meetings. So it's just such a great diverse group that are really serious about being in working in the makeup industry. So that's there are so many things to take away. Brandi: [00:07:29] *laughing* You're like: How do I just like do this in one thing? I can't! Megan Walker: [00:07:33] Exactly. Exactly. Brandi: [00:07:34] Well I feel really excited about the fact that you pulled away so much because I think that's what people sometimes don't always see or understand. You know what do you go to school for. You go to school for education, but it's so much more than that. Like the community and the network and the people that you meet which lead to job opportunities and the experiences that you get. It's not just education. So I think if I were to try to sum up what you said, that might be the way I would do it. That's awesome. I do have another question for you. Were there any challenges or what was maybe the biggest challenge for you when you were learning? If you can think back. Megan Walker: [00:08:30] No. I mean I think I look back at some of my photos of some of my beginning work and I think my greatest challenge was overcoming my fear. Mm-hmm. As with any new endeavor you're gonna have fear you're gonna have obstacles you're gonna have difficulties. And I think my most significant barrier was myself. I think I remember it took me an hour and a half to put on makeup and a model you know. And now I'm at 45 minutes or right underneath 45. So I think getting out of my own head and not thinking about it so much was my personal biggest obstacle. You know once I kind of learned and really accepted that. It's makeup. You can take it off. You mess up. So sure. So I think that was for me my biggest obstacle that I had to overcome and now I just. I guess for me personally paying attention to detail is so important especially in this trade. Yes, it's all in the details that's why we're in this. Once you kind of learn to perfect and master, it's kind of the little detailed fundamentals. That's what helped me overcome a lot of the challenges that I was facing. So just thinking it's all in your head, at least for me. Brandi: [00:09:47] That's good advice. Yeah, yeah. No, I think that's excellent advice, and it happens to a lot of students when they're learning look because you want to be perfect. So it's like I want to be, but you will be good with practice and with time and with coaching and all of those things. So I think that's excellent advice! Like fear holds you back from a lot of things. From taking the first step and from making it to the next level. So I think that's a big thing to overcome. So my last question I think would be you know what is it that is your greatest achievement so far. What would you say is your greatest achievement. I would think. It would be graduating with honors and with a community award because you guys hold that to such a high standard and that is part of your vision. Part of your mission is the community and to have that be awarded and honored to me was. So humbling and so. Monumental in my career. Just to know that you guys recognized that I was trying to really be a crucial and influential part of our community. That you guys have created was a tremendous honor. I mean I was not expecting that whatsoever. And so that right there just kind of set the tone for my confidence going out into the industry and working. It was so humbling, and I know Sammy won it with me. Yeah. So we were tied, and it was, and I just couldn't believe it. So I would say that it was Quite honestly the Kickstarter to my career. Brandi: [00:11:29] That is amazing. Yeah, I think that's awesome. So during our graduation, we give away awards, and the students never know, and so Megan was the recipient of that award because really you exuded that community and that is ultimately what we're about. Well, thank you so much, Megan. Honestly, it's always a pleasure to talk to you. And we wish you much-continued success. Megan Walker: [00:11:58] Thank you. Brandi: [00:11:58] It's you know you'll forever be a part of our community. So we thank you for that. But thanks for your time. Megan Walker: [00:12:02] Thank you for having me. This was awesome! Want to learn more about MMA?